If you have ever been walking on a rainy day, you know there’s a lot more to deal with than just the rain falling down. Puddles often form in depressions on the road, and some motorists enjoy driving through these puddles due to the splash they make – but you would think that people would avoid driving through the puddles when they are near pedestrians. Well, you’d be wrong. 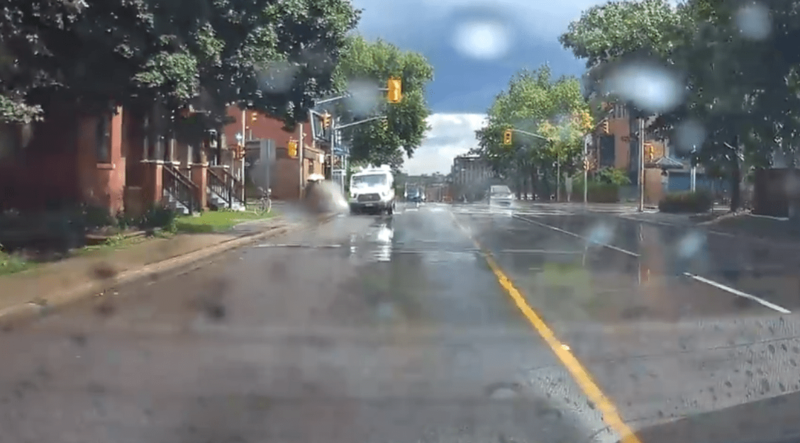 In dash camera footage that was recorded on July 27th in Ottawa, Canada, a driver of a white van is seen purposely driving in puddles with the intention of splashing pedestrians on the footpath. In at least once instance the driver somewhat dangerously swerves towards the curb to drive through the puddle. “We apologise to everyone impacted by the recent incident in Ottawa of unacceptable driving by one of our van drivers. We want to reassure the public that safety is our #1 priority. Mark Gatien, a sergeant with the Ottawa Police said the man could have faced criminal charges which could include mischief as there is no doubt the driver’s actions were deliberate. Gatien also added that the driver’s actions could have led to assault charges, as the amount of water and speed at which pedestrians were hit may have caused injuries. Whilst the individual behind this is no longer employed by Black and McDonald Limited, they still have their license.